Mort Kunstler Hand Signed and Numbered Limited Edition Canvas Giclee:"Washington's Inauguration"
Edition: Artist Signed and Numbered, Limited Edition to 100 with 10 AP's. COA included. 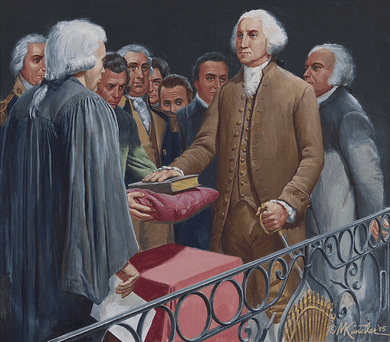 About the Art: George Washington was the obvious choice for first president of the United States. The delegates who framed the Constitution had created the office with him in mind. Nevertheless, he did not enjoy the prospect of reentering public life so soon after leaving it. On April 16, he wrote in his diary: "I bade adieu to Mount Vernon, to private life, and to domestic felicity; and with a mind oppressed with more anxious and painful sensations than I have words to express, set out for New York�with the best dispositions to render service to my country in obedience to its call, but with less hope of answering its expectations." Just after noon on April 30, Washington appeared on a balcony outside the Senate chamber at Federal Hall in New York, then the nation's capital. According to one Eliza Quincy, an eyewitness, he was "announced by universal shouts of joy and welcome. His appearance was most dignified and solemn. Advancing to the front of the balcony, he laid his hand on his heart, bowed several times, and then retreated to an arm-chair near the table." On this table was "a rich covering of red velvet; and upon this, on a crimson velvet cushion, lay a large and elegant Bible." He took the oath at one o'clock from Chancellor Robert R. Livingston of New York; Washington's secretary, Tobias Lear, noted that "the moment the chancellor proclaimed him president of the United States, the air was rent by repeated shouts and huzzas - 'God Bless our Washington! Long live our beloved President!'" Representative Fisher Ames of Massachusetts wrote that "it was a very touching scene, and quite of the solemn kind. His aspect grave, almost to sadness; is modesty, actually shaking; his voice deep, a little tremulous, and so low as to call for close attention." The world, Washington knew, was watching.